analgesic, anticoagulant, antidepressant, antifungal, antihistamine, antiviral, anti-inflammatory, antimicrobial, antiseptic, antispasmodic, antitoxic, antitumor, cooling, decongestant, regenerative, sedative - Definitions. Lavender is my very favorite essential oil (and herb for that matter). 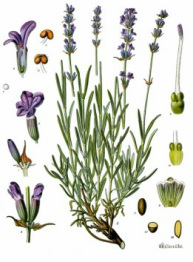 When in doubt of what oil or herb to use for an ailment you can go for lavender, it is a cure for all that may ail you. Lavender is well known for its gentle, yet powerful affect on children and babies and can be used for everything from burns to stress relief and cosmetic use.